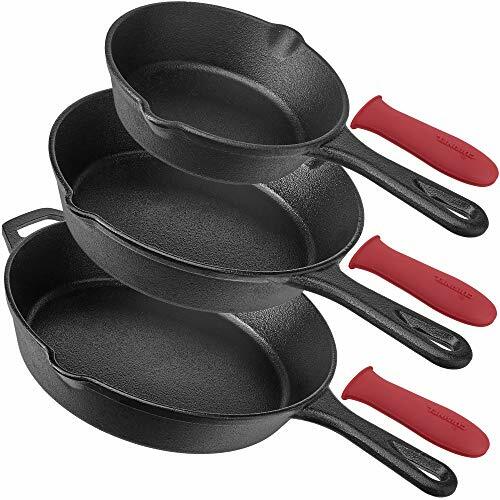 Cuisinel Pre-Seasoned Cast Iron Skillet 3-Piece Chef Set — Deals from SaveaLoonie! PRECISION HEAT DISTRIBUTION - This cast iron skillet has a smooth finish to help provide even heat distribution for improved cooking and frying, even on grills, stoves or induction cooktops. TRUE COOKING VERSATILITY - The Cuisinel cast iron skillet pan can be used for frying, baking, grilling, broiling, braising, and sautéing meats, vegetables and more! SUPERIOR CRAFTSMANSHIP - Each all-purpose fajita skillet is crafted with seasoned cast iron that can outlast years of regular cooking and washing for long-term reliability. EASY TO CLEAN & MAINTAIN - Cast iron skillets should be hand washed with warm water and restored with natural oils; that means no soap or dishwasher use.